The snowman's circle range from 1" to 1-3/4". These dies are compatible with most tabletop die cut machines. Craft die from Impression Obsession featuring a tree split in half. This is a set of 2 dies. Each one measures 2 x 4 inches. They can be used separately on the edge of a card like a gatefold card or together to make a single die cut tree. This is a single die measuring 1-1/8 x 3-1/2 inches. Features the sentiment "Sunshine". These dies are compatible with most tabletop die cut machines. This is a single die measuring 1-3/8 x 3-1/2 inches, featuring the sentiment "Thankful". These dies are compatible with most tabletop die cut machines. This is a single die measuring .875 x 3 inches. These dies are compatible with most tabletop die cut machines. Craft die featuring a landscape with trees. This is a set of 3 edger dies. They have no bottom edge so you can make the layer however tall you want by using a paper trimmer. They are 6 inches wide. The tallest tree is 2 inches tall. These dies are compatible with most tabletop die cut machines. 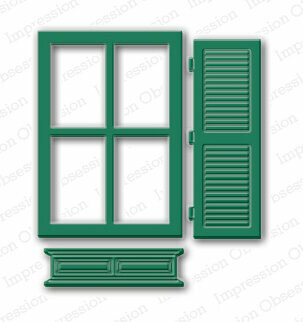 Impression Obsession die featuring the sentiment "Welcome". This die measures 3/4 x 2-3/4 inches. This is a single die measuring 1-1/4 x 3-1/2 inches. Features the sentiment "Wishes". These dies are compatible with most tabletop die cut machines. Love themed Impression Obsession die featuring the sentiment "You & Me". US-made steel die compatible with most table-top die cutting machines. This is a single die measuring approximately 1-1/2 x 1-3/4 inches.